This sky map shows how the constellation Delphinus the Dolphin at about 10 p.m. ET in October 2010 to skywatchers in the Northern Hemisphere. Atiny constellation can be foundsoaring high in the southern part of the sky, almost directly overheadforskywatchers in the Northern Hemisphere this week. It's Delphinus thedolphinand this cosmic marine mammal is not alone. TheconstellationDelphinus is a star pattern composed only of faint stars, yetthe stars areso close to each other that they can easily be seen on clear, darknights. Avariety of different descriptions have been used in various astronomyguidebooks for Delphinus; everything from charming to just plaincute. 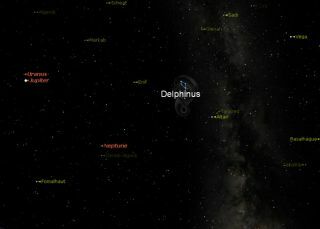 Thissky map shows where tofind the constellation Delphinus in the night sky. It makes itsappearance around8 p.m. local time, weather permitting. AlthoughDelphinus possesses nostar brighter than fourth magnitude, it has several as bright as that.Magnitudeis a measure of brightness for night sky objects. The lower the number,thebrighter the object. Assuch, Delphinus forms adistinctive diamond-with-a-tail pattern that gives this group aprominencegreater than you might otherwise expect from so faint aconstellation. Somereference books refer to the Delphinusdiamond as "Job?s Coffin," though the origin of this name is unknown. Twostars in Delphinus haveratherodd names: Sualocin and Rotanev. They first appeared in thePalermo StarCatalogue in 1814, but nobody seemed to have a clue as to their origin. TheEnglish astronomer Thomas Webbfinally solved the mystery by reversing their letters, revealing thename ofNicolaus Venator, the Latinized form of Niccolo Cacciatore, the valuedassistant and eventual successor of Palermo Observatory?s directorGiuseppePiazzi. Butto this day nobody knows whetherit was Piazzi or Cacciatore himself who ultimately christened these twostars. Thetale of Delphinus comes fromancient legend. Itgoes something like this: Arion,a Greek musician, was sailing to Corinth, carrying a substantial cacheof moneyand jewels. Unfortunately, the ship?s crew planned to throw Arionoverboard andabscond with his treasure. Whenconfronted by the pirates,Arion requested that he be allowed to play his harp one finaltime. The musicattracted the dolphin Delphinus. Upon seeing the dolphin, Arion jumpedoverboard and was carried safely to shore. When the ship docked atCorinth, thecrewmen were arrested and hanged. Arion recovered his treasure and thedolphinwas given a place of honor in the sky. On Earth,dolphins are marine mammals ? a group that also includes whales. Therearewhales in the night sky, too. As the constellation Delphinushappilyswims high in our south-southern sky during early evening hours, itscosmicwhale cousin Cetus will be emerging into view, sprawling above thesoutheasthorizon. This Cetus constellation sky mapshows where to look for the whale constellation. Knownby the ancient Greeks as thewhale that was about to attack Andromeda when Perseus destroyed it,Cetus waslater thought to represent the whale that consumed Jonah. However, ifone wereto look at some of the allegorical star atlases of the past few hundredyears,the portrayals are hardly what we know whales to be. Infact, not a few astronomy guidesrefer to Cetus as a sea monster even though, ironically, the scientificnamefor the whale order is Cetacea. Some star atlases, in fact, depictedCetuslooking more like Godzilla with a fish tail. Cetusconsists chiefly of faintstars, but it occupies a relatively large part of the sky. His head isa groupof stars not far from Taurus and Aries, and his body and tail lietowardAquarius. Overthe next week, the long-periodvariablestar Mira ? actually the first-ever variable star to bediscovered ? isforecast to reach its predicted peak brightness. In the 2010 Observer?sHandbook of the Royal Astronomical Society of Canada, Mira should be atpeakbrightness on Oct. 14. In1596, David Fabricus (1564-1617)an amateur astronomer and native of Friesland, the Netherlands, saw athirdmagnitude star in the constellation of Cetus. As the intruder faded inthefollowing days and weeks, it was logical to suppose that it was a nova. Then,Johann Fokkens Holwarda(1618-1651),also of Friesland, watched this ruddy star brighten andgrow dimagain over an 11-month interval during the year 1638. While a novawould not beexpected to reappear, this was apparently flashing on and off again.Itsexistence with variable brightness contradicted the Aristotelian dogmathat theheavens were both perfect and constant. Asastronomers became aware of theunusual fluctuations they honored the star with the name Mira, the"WonderfulStar." Mira grows brighter, then fainter, then brighter again inregular,predictable cycles of approximately 332 days, and it rises to itsgreatestsplendor twice as fast as it fades to obscurity again. Atits faintest, Mira is about 15 timesdimmer than the faintest star that you can see without atelescope. At maximum,it usually reaches third magnitude, or about 250 times brighter. Thestar is estimated to be a 6 billion-year-old red giant. Currently,Mira risesabove the eastern horizon shortly after sunset and is well up in thesouthernsky by around midnight. Try looking for it the first clear night thisweek.